Thank you to everyone who registered! Good luck at the fair! Submit revisions to your ISEF paperwork using the link below. Time to start thinking about your science fair project! Yipee! We've seen many amazing things happen in science & technology this year. Crazy-cool stuff! So, first things first: figure out what you are going to do for your science fair project. Hint: make sure it's something you really care about and are excited about. Here are a few interesting project ideas we came up with. Elementary & Junior Division students (Grades 5-8) need to fill out and return a registration form to their teachers. To make it easy, we've updated this form so you can fill it out & sign using without printing it first. Here are a few video tutorials on how to sign your PDFs digitally. Note to Firefox users: the PDF reader built into Firefox does not allow you to fill in the PDF electronically, but you can download and use Adobe Acrobat. All senior division students are required to complete an important set of documents for your project. This is no easy task, and must be done correctly and on time—you should get started today! To assist students with this process, we created a section of our site that allows you to find out what forms you need for your particular project and download them. When you've finished filling them out & gathered any signatures you need, you can then upload them to the same site and our staff will review them for accuracy and completeness. If there are any errors or omissions, we'll help you fix those. Once the paperwork above is filled out, and you've won your district fair, you can register your project for USEF. Students who place at their district fair will be given a special username & password so you can register their projects online. Registration is now closed for the 2019 fair. Fee waivers are available for students who cannot afford the registration fee. Students must register on time to receive the fee waiver. Students registering late (on or after February 16th) will not be eligible for a fee waiver. Who is eligible for a USEF grant? Students in grades 10-12 who attend private, charter, public home or parochial schools within the USEF qualifying districts which include Canyons, Granite, Murray, Park City, Salt Lake and Tooele School Districts as well as the Salt Lake Catholic Diocese. How much money can I receive from a USEF grant? Students may submit a grant application for up to a maximum of $250 per project. What expenses may be reimbursed? Students may be reimbursed for expenses relating to their research project and display board. What expenses are NOT eligible for reimbursement? The items listed below will not be covered by a USEF grant. USEF reserves the right to decline funding items not on this list. Printers or other technology not required for completion of the project, including phones, tables, laptops, etc. Should I included taxes and shipping in my budget? Yes, please include taxes and shipping. If these are not included in your budget, they cannot be added later and will not be reimbursed. You may include these as an estimate. When and how do I turn in my receipts? What if I have an unexpected expense that wasn’t included in my application? Can that be added after I am awarded funding? Expenses relating to your project or fair may be considered if the USEFapproves the adjusted amount in advance. Awards may not exceed the maximum allowed for grants. I spent less/more on one item in my budget than I anticipated. Will that change my award? Students may have minor changes in expenses relating to the cost of different items. If less is spent on the project than anticipated, reimbursement will be offered at the amount of the expenses as show by the submitted receipts and not the full amount of the award. If more is spent on the project than anticipated, the student must petition for an increase in the grant amount, not to exceed the maximum allowed for grants. Your sponsor is the adult supporting you with your project. The sponsor may be a parent of family member, teacher or adult friend. 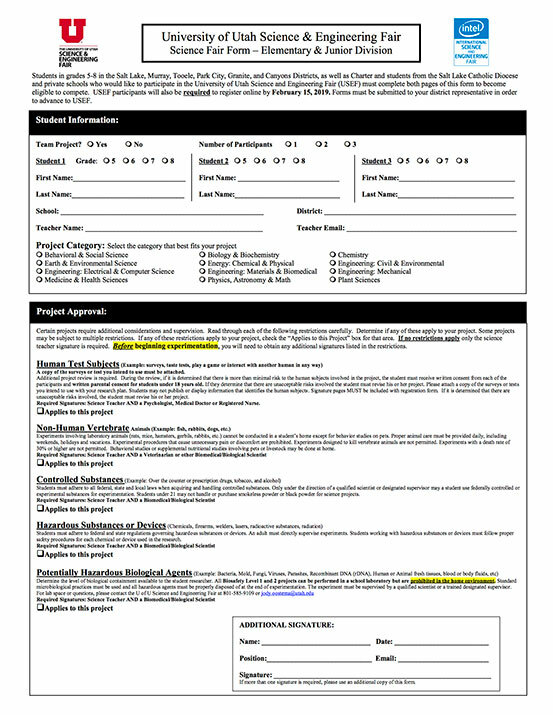 Students are required to provide the name and email address of their sponsor in the application. How does my listed sponsor submit a letter of support of the application? Once the student(s) finishes the application and lists their sponsor’s name and email address, instructions will be emailed to the sponsor. The sponsor is required to provide a letter of support for the student or team. This letter of support should include the sponsor’s confidence in the project and the student’s ability to follow through until completion as well as a verification of the supplies needed for the project to support the grant amount requested. How do I apply for the USEF grant? Fill out this Grant Application and email it with your supporting documentation before the deadline. What is the deadline for grant applications? The deadline to submit grant applications is Friday, November 16, 2018, before midnight. When will I know if I qualify for a grant and the amount of the reimbursement? Students and sponsors will be notified no later than November 30, 2018 if they qualify to receive a USEF grant and the amount that they will be reimbursed. Reimbursement for expenses will be sent once all receipts have been submitted. A reimbursement check will be issued and sent by mail. Special circumstances will be considered to award grant money at the beginning of a project to purchase supplies. Please email Jody if you would like to request early payment. Please send questions to jody.oostema@utah.edu. Be sure to include your name, school and sponsor. Do you want to make the science fair even better? We'd love to have you on a special Student Advisory Board. Learn more & apply here. The University of Utah Science & Engineering Fair (USEF) is one of seven Regional Science Fairs in the State of Utah. If you are in 5th-12th grade attending a private, public, charter or parochial school in the Salt Lake, Tooele, Granite, Park City, Canyons or Murray School District, you are eligible to compete at USEF. You must first compete and win at your school and/or district science fair to advance to USEF. When you win at your school / district fair, you will be given a special certificate with instructions on how to register for USEF. If your school does not hold a science fair, please contact Jody to discuss options for you to participate. A science fair project is an exciting thing! Pick a topic and ask a question! It's that easy! Any topic that interests you can be turned into a science fair project. Airplanes? Roller blades? Fish? Dogs? Baseball? All involve science or engineering. Formulate a hypothesis! Enlist the help of your English and Math teachers as well as your Science teachers. Your English teacher can help you with putting together your background research paper and writing up your notebook and display board. Your Math teacher can help with the planning of experiments and analysis of data. Be creative with your subject and project. Experiment with different concepts and ideas—the more innovative you are the better. Our Student Advisory Board wrote a helpful guide giving their insight into participating in USEF. It includes tips & advice for how to choose a project, keeping a journal, making a great display board, and a review of the judging process. The guide was written by Mirae Parker, Michelle Wei, Bovey Rao, Naveen Rathi, Brandon Cui, and Nityam Rathi, who were all members of the 2013-2014 Salt Lake Valley Science and Engineering Fair Student Advisory Board. Box lunches will be served during the fair. We'll deliver box lunches between 11:00 am and Noon and you can eat them whenever you get hungry. There are three choices including a vegan / gluten free option. All lunches are nut- free. You will choose which lunch you want when registering your project. Students and parents often wonder how projects are judged at USEF. You can read all about that process here.